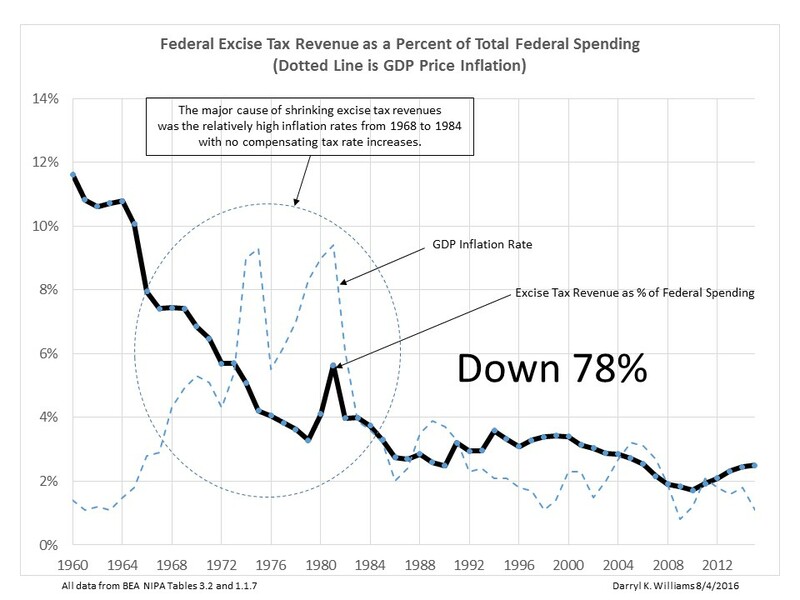 Worrying about how we fund federal spending, I noticed that in 1960, federal excise tax revenue funded 11.6% of federal spending, but, in 2015, it funded only 2.5%. That is a big change, down 78%. 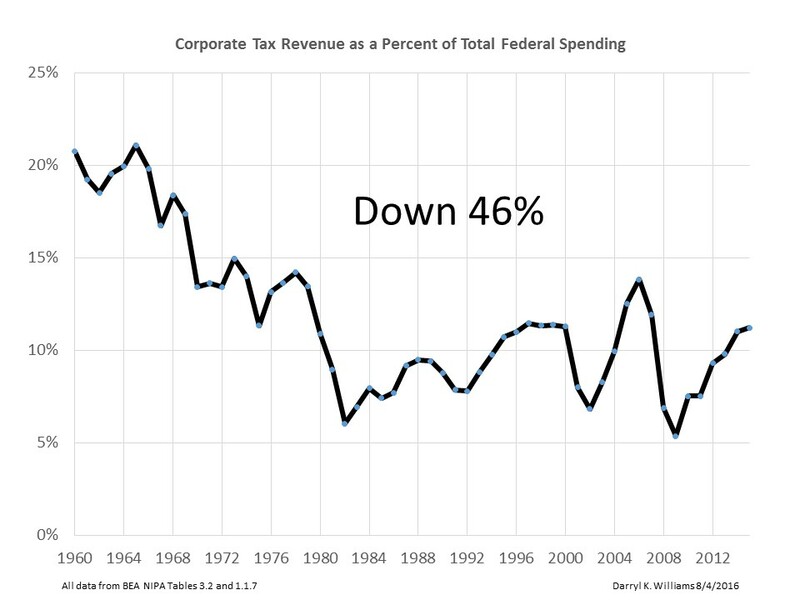 I looked for other big changes and found that corporate taxes funded 20.7% of federal spending in 1960 but only 11.2% in 2015, a decrease of 46%. So, the total of excise and corporate taxes dropped from funding 32.3% of spending to only 13.7%. Since most excise tax rates are set based on number of units, so much per gallon of gas or so much per pack of cigarettes for example, rather than a percent of cost or sales price, inflation tends to drive down the revenue. We had a lot of inflation in the 1960’s and 1970’s. I’m guessing some in congress argued to increase the excise tax rates to offset the inflation, but probably faced a lot of lobbying resistance from industry representatives. Nobody in the oil industry wants to see higher excise tax rates on gasoline, and nobody in the liquor business wants higher excise tax rates on a fifth of Jack Daniels. Of course lobbying is the big factor on corporate taxes also, industries clamoring for concessions such as deductions, allowances, credits, exclusions, and exemptions, not to mention lower rates. The top corporate tax rate was in the range of 50% through the 1960’s and 1970’s but was reduced in the 1980’s to around 35% where it remains today. Those rate decreases were probably necessary as globalization came into play and US corporations found their competition to be from other countries with lower tax rates. With all the unfair concessions, however, the effective tax rate on US corporations is often much lower. Some revenue sources must have increased to offset those big decreases. It was mostly payroll taxes for Social Security and Medicare which covered only 15.5% of federal spending in 1960 but rose to 29.3% by 2015, an 89% increase with lots of ups and downs on the way. 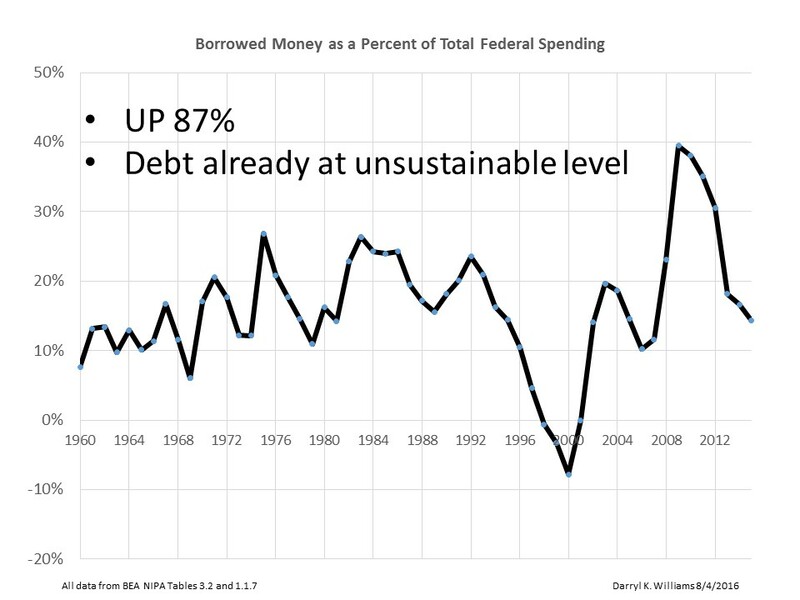 That and borrowed funds which rose erratically from 7.7% of spending in 1960 to 14.3% in 2015. 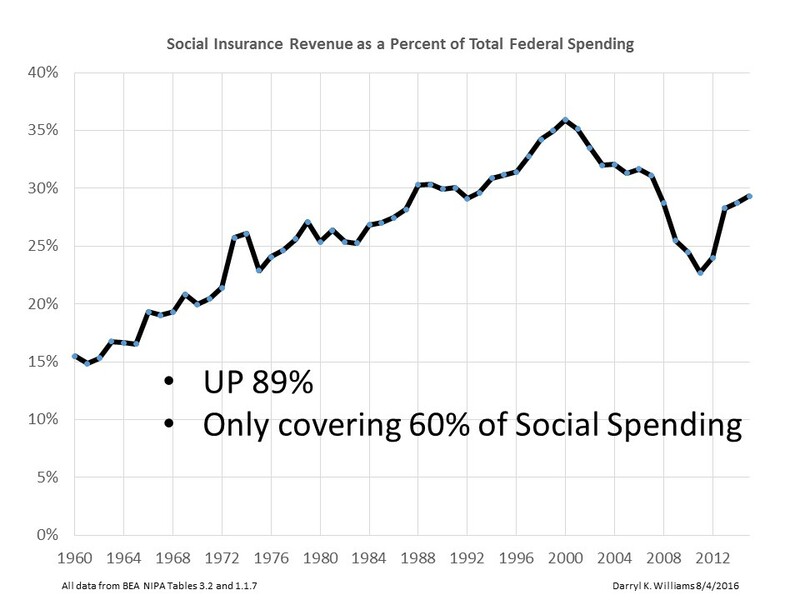 There is no good news here, especially since the social insurance collections, though up 89%, are covering only 60% of the federal social spending. Lots of people and parties and organizations are lobbying for increased social payments also…and lower taxes. 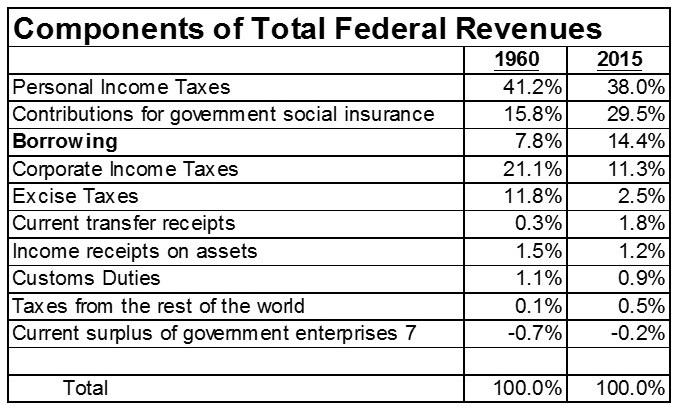 Here is the whole picture on sources of federal revenues in 1960 and in 2015. So, I started out worrying about excise taxes, progressed through worrying about lobbying and the associated campaign contributions and votes and influence, and the constant pressure on our senators and representatives to raise money and get re-elected and to vote in ways that help them do that, and ended up worrying about the future of our country. If the system we have had delivered a tax structure that covers our spending and makes sense and does not unduly restrict economic growth, I wouldn’t worry and complain, but that is not the case. We have a corrupt system, pressure, influence, and short term thinking trumping wisdom and good management, and a complex and convoluted tax code, all combined to result in historically low economic growth and unsustainable levels of national debt. All contact between lobbyists and elected officials must be in group meetings of at least five persons with an uninterested lawyer present and must be recorded and available for public perusal. No one individual may serve more than 12 years as a federal elected official. All political campaign contributions, whether for parties or candidates or ideologies, must be published in real time and available for public perusal. Comprehensive tax reform to include elimination of exemptions, deductions, credits, exclusions, concessions, etc., and establishment of lower fixed rates to eliminate the game playing between congress and various vested interests. It is time to stop lobbying for our country to do more for us and to figure out what we can do for our country. There is no justification for the wealthiest country in the world to run up unsustainable debt such as we have done over the past forty years.